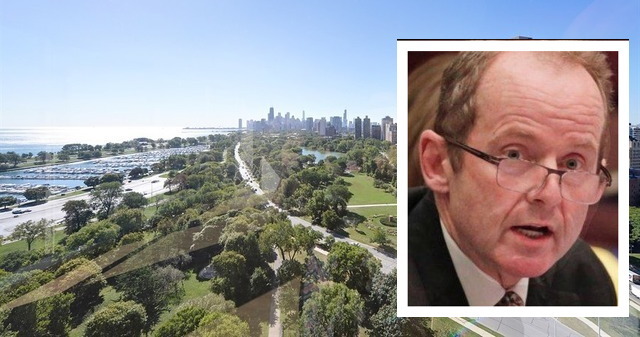 While ordinary citizens had to call 911 and wait their turn for police service Saturday, 44th Ward Alderman Tom Tunney (inset) used a private line to order up a King-sized police response for his noise complaint. It’s no secret: In Chicago, ordinary citizens routinely endure long waits for routine police service. But 44th Ward Alderman Tom Tunney is not a common citizen. He’s an alderman so that apparently entitles him to special police services. According to multiple police sources, Tunney dialed a private number at the 19th District police station around 10:50 Saturday evening and demanded that officers shut down “loud music” at Diversey Harbor. Tunney’s 18th-floor condo at 330 West Diversey overlooks the harbor from a distance. The view of Diversey Harbor from the unit located 3 floors directly above Alderman Tunney's condo. While most neighbors would consider themselves lucky to receive any kind of police response to a low-priority noise disturbance, Tunney’s complaint gained the attention of a lieutenant, a sergeant, two patrol cars and a rapid response unit. That’s right. A rapid response unit—which typically trolls higher-crime areas to pounce quickly on incoming violent crime calls—was diverted to handle the sleepy alderman’s noise complaint along with the others. Responding officers “saw no harm…and refused to hassle” the folks who were celebrating the end of summer at the harbor, one source said. Tunney's office did not respond to a request for information about the incident. This is not the first time that Tunney turned to his private helpline because the harbor was too noisy for his personal comfort. In September 2015, Tunney called the 19th District around 9:30 p.m. to complain about a “rock concert” at the harbor. Responding cops were given strict orders: "check their permit or shut it down" per the alderman. Officers who arrived on-scene discovered "this is not a rock concert at all. It's some boaters. They turned the music down." It must be nice to be a member of the elected class that gets expeditious police service for such non-criminal matters, particularly since those officers would have been better used on legitimate public safety concerns. In a district where police resources have been completely depleted on 121 occasions already this year, you’d think the local elected officials would be more discriminating in their law enforcement demands.